Each year, millions of people try to achieve their “dream figure” through diet, exercise, and even at-home slimming devices that are just not enough to remove stubborn bulges of fat. By combining your active lifestyle with safe non-surgical fat reduction treatments, achieving your “dream figure” can now be a reality. The Cryolipolysis and Shockwave Therapy combination is the latest and clinically-proven technologies in the fat reduction industry. Cryolipolysis, also known as the fat freezing procedure, and Acoustic Shockwave Therapy, come together to deliver amazing and even better fat reduction results. Learn more about these treatment options and exactly how they work. There has been much research about the effectiveness of the Cryolipolysis and Shockwave Therapy combination for fat reduction. 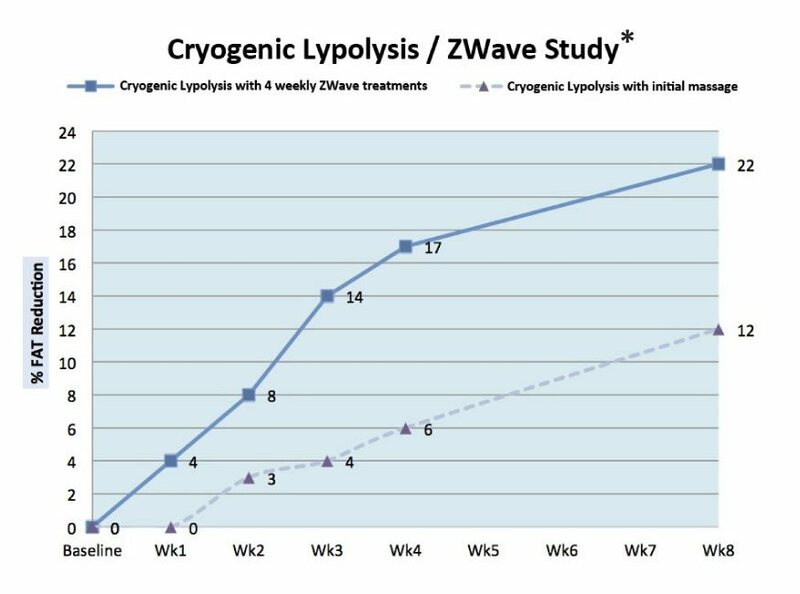 A clinical study from the US has proven that undergoing Cryolipolysis with weekly acoustic shockwave (Z Wave) treatments resulted in more rapid fat absorption. It takes several weeks for adipocytes (fat cells) to break down and absorb after a vigorous 60 minute Cryolipolysis treatment. By combining Cryolipolysis with weekly acoustic wave treatments, the rate of fat absorption can be increased resulting to faster reduction of fat bulges. During the clinical study, the Cryolipolysis treatment were well tolerated by ten subjects. After their Cryolipolysis treatments, it then followed by an initial massage.Five subjects (Group A) were given additional acoustic wave procedures. While the other five (Group B) only had the initial massage. The results were outstanding. The average fat reduction in both groups A and B were calculated on a weekly basis for 4 weeks and then at 8 weeks. Group A with acoustic shockwave (Z Wave) treatment had over twice the fat reduction during each week, from week 1 to week 4, when compared with group B. For Group A, over 75% of the fat reduction achieved at 8 weeks was realised at the week 4 visit. However, Group B was seen with slower and more gradual fat reduction rate. Patients were not placed on a diet and the weights for both groups were relatively stable. As you can see in the graph below, there was significant fat reduction when the combination treatments were used compared to those with just the initial massage. Cryolipolysis works by freezing fat cells to the point of natural elimination. The cold temperature breaks down the fat cells and the body naturally eliminates them. While the fat cells are destroyed, the surrounding skin and structures remain safe and free of injury. Cryolipolysis remains the safe and effective non-surgical fat removal treatment with over 1,000,000 procedures performed worldwide thus far. If you are struggling with fat bulges or have excess fat despite having followed a diet and exercise plan, you may be a good candidate for Cryolipolysis. The overall goal of the fat freeze procedure is to reduce the volume of the fat bulges resulting in a slimmer and more contoured body figure. Some areas may need more than one treatment, depending on the amount of “pinchable” fat which may vary from every individual. The procedure is non-surgical so it is performed without anesthesia and requires no preparation or downtime. Besides from breaking down fat deposits, acoustic wave therapy can also get rid of unsightly cellulite. Shockwave cellulite treatments offers safe fat removal to firm and smoothen out skin. Shockwave treatment works by emitting a series of acoustic pulses which vibrate the connective tissues in areas with heavy cellulite and fat deposits. The treatment is FDA approved and works effectively. Most aesthetic doctors recommend at least eight and ten sessions total at weekly intervals to achieve optimal results. Do you have “problem areas” that you just can’t seem to shake even with rigorous exercise? The combination of Cryolipolysis and Shockwave therapy treatments can help you get the dream figure you always wanted to achieve. Learn more about these effective fat reduction procedures by scheduling a consultation with our Harvard-trained aesthetic doctor, Dr. Sylvia Ramirez, at the Cutis Laser Clinics in Singapore.